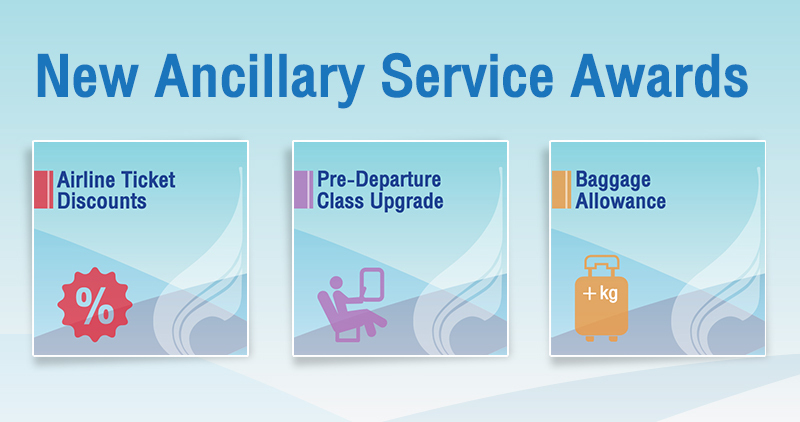 Introducing 3 New Ancillary Service Awards – make every journey a joyous one! From 01 August 2018 onwards, FlyerBonus would like to introduce three new ancillary services awards to our members. These services will make traveling much easier and more convenient. There are Airline Ticket Discount Vouchers, Baggage Weight Allowance Vouchers and Pre-Departure Class Upgrade Vouchers. After redeeming your ancillary services awards voucher, to confirm the usage of our ancillary services members can simply present your voucher at our ticketing offices or contact our Call Center 1771 then mention your voucher code to our staffs. Members can now redeem your points for Airline Discounts Voucher value 1000 Points for 100 Baht, 3000 Points for 300 Baht and 5000 Points for 500 Baht. These vouchers can be used for Bangkok Airways flight, operating from Bangkok to various destinations. Make every journey possible in a blink, just redeem your Airline Discount Voucher today! Worry free on your baggage allowance! FlyerBonus members can check-in more items conveniently with our Baggage Weight Allowance Voucher. The available Baggage weight allowance vouchers value starts from extra 5 kilograms for redemption of 2,500. To redeem this awards go to flyerbonus.bangkokair.com and access Member's award redemption menu; no less than 4 hours before flight departures in any domestic routes. Be it souvenirs for your family, friends, toys for your love ones or gadgets and your dream shopping list items – just bring it all on and check-in with this Baggage weight allowance voucher! We make your trip a guilty pleasure! Members can redeem a Pre-Departure Class Upgrade Voucher for both exciting and scenic routes such as Bangkok to Samui, Maldives and PhnomPenh. Or Samui to Singapore, and Hong Kong. On the date of travel, redeem your Pre-Departure Class Upgrade voucher on flyerbonus.bangkokair.com for classes Y&M, and stand-by for your upgrade. Most importantly, to claim your vouchers, do so by presenting your voucher at our ticketing offices or simply contact our Call Center 1771 then mention your voucher code and award type to our Call Center Staff. Redeem your ancillary services awards now through, Redeem Awards link here!